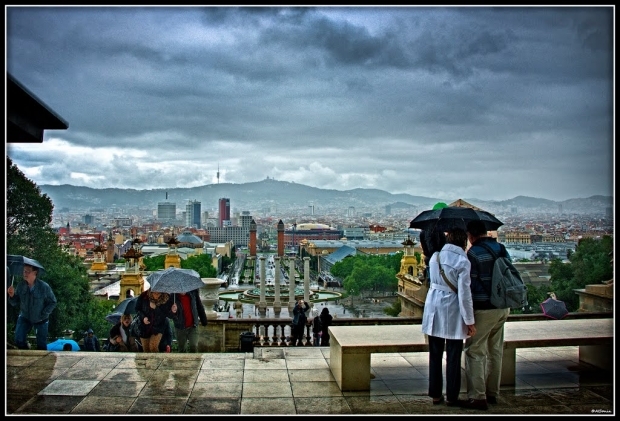 Barcelona on a rainy day seen from the museum’s terrace. Photo: Al Sanin. The reasons for visiting a museum can be as varied as the people who visit it. In the present moment, thanks to museum audience research and the use of demoscopic techniques, museums can get a very accurate knowledge of the profile of their visitors, motivations and tastes. We would like to analyse one of these reasons that could be considered as lower ranking, but among all the possible reasons for visiting a museum it takes on its own importance; the increase of visitors and revenues that the museum undergoes on rainy days. Can we establish a hypothesis that directly relates the increase of visitors and revenues with the rain? According to the figures collected in the Annual Study of Public 2013, 83% of the visitors do so on an individual basis, people who at one time or another have decided to come to the museum attracted by the interest of the collection, of a temporary exhibition or to get to know the Palau Nacional as an emblematic building, part of the heritage of Barcelona. But this supposition is not totally correct. Among this 83% we have to count the visitors who are escaping the rain. It is more than likely that these visitors hadn’t included in their schedule a visit to the Museu Nacional as one of their first options. According to figures provided by the Observatori Fabra, from January to September 2013 in Barcelona it rained 21 days more than 5 mm. 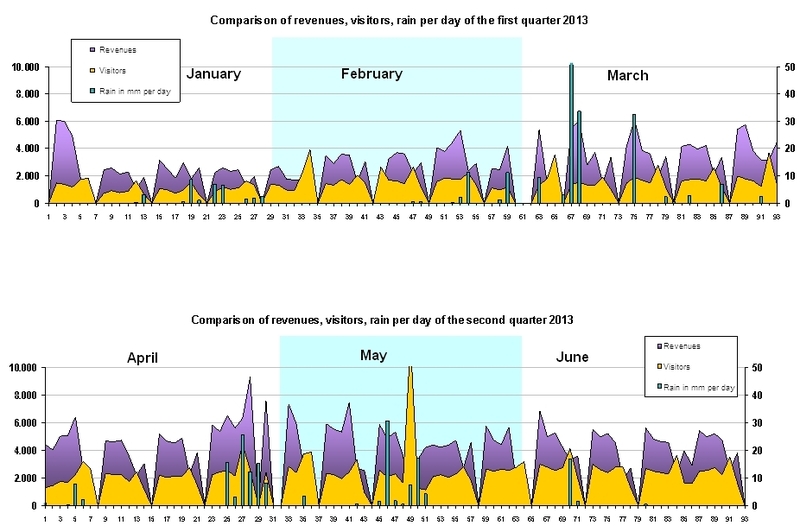 A chart which combines the days of rain, the visitors and the revenues, for example, during the first semester of 2013 shows us that a fine rain or drizzle has no notable repercussion either on the number of visitors or the revenues. A complete series of rainy days or of no rain for a certain period doesn’t, therefore, demonstrate the hypothesis that rain equals more visitors. However, if we take a closer look, the same chart shows that rain of more than 20 mm, considered to be abundant or of strong intensity, is responsible for the increase of visitors to the museums and, especially, for revenues from ticket sales. In this same period we can find five days in which the rainfall is the same as or higher than this quantity of precipitation, and the influence can clearly be seen. This can be understood if you take into account the fact that museums are covered spaces, easily accessible, always interesting and open to the public practically every day of the week. These conditions inherent in their functioning, make them a good alternative if you planned to go to the beach or to walk around the city and it’s raining. We could say that for visitors of proximity that had other plans or for tourist of “monuments, shopping and tapas”, the Museu Nacional is a magnificent Plan B on the days when it rains a lot in the city. Without a doubt, among the beneficial effects of the rain we should include the generation of a segment of new public that unexpectedly enjoys a cultural activity, as well as the capacity to act in an indirectly prescriptive way, probably because the visitors, pleasantly surprised, recommend or prescribe the visit to the Museu Nacional to whoever they may explain their trip to Catalonia or their excursion to Barcelona and with whom they share their experience and photos on the social media.